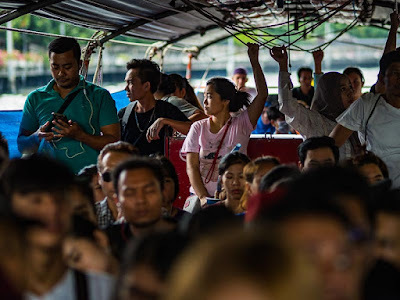 Morning commuters on the Khlong Saen Saeb passenger boat head into Bangkok. I went out today to photograph in Ramkhamhaeng area of Bangkok. 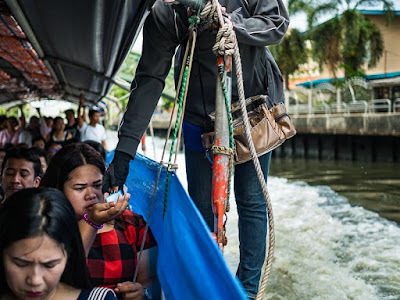 I rode the Khlong Saen Saeb boat from Asoke Pier out to Wat Sriboonrueng. The boat is sometimes called a "water taxi" but that's not really an accurate description. It's more of a "water bus" since it plies a set route, and you don't call one to come get you. 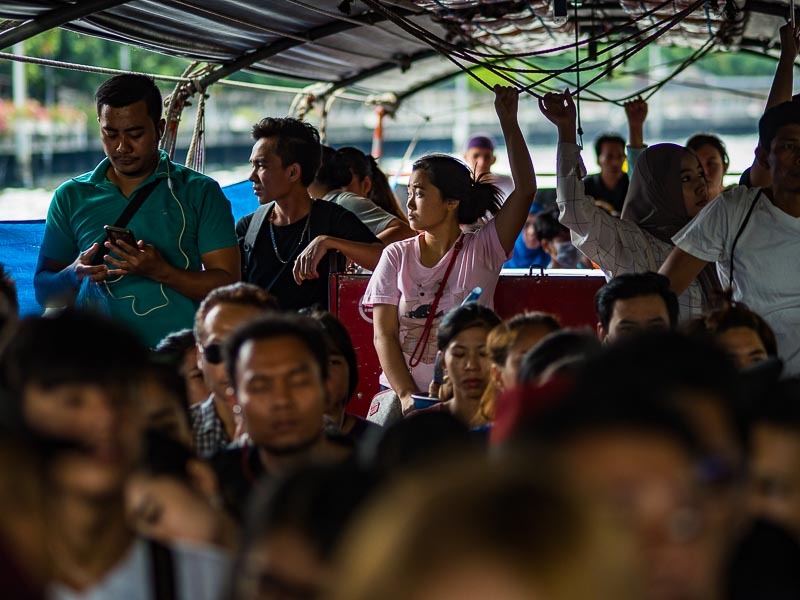 You ride it with hundreds of other Bangkok commuters. 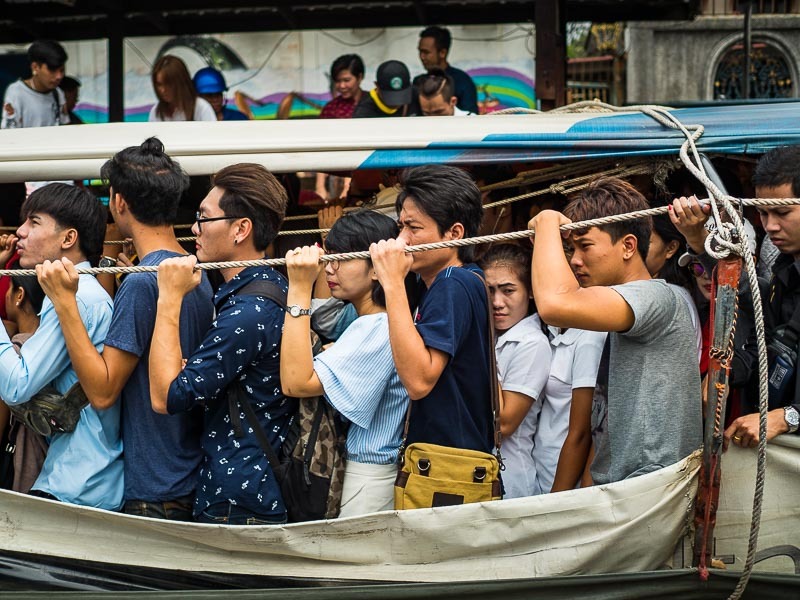 Passengers go into Bangkok on one the Khlong Saen Saeb boats. Riding the boat is a pretty good way of seeing a different side of Bangkok. It's a much faster way of getting from Point A to Point B because it doesn't get stuck in traffic and it's cheap. My boat fare was 18Baht, about .52¢ (US) to go 11 kilometers (about 6.5 miles). It took the boat about 30 minutes to make the run. A taxi would have cost me about 180Baht ($5.20 US) and taken 45 minutes to an hour (thanks to Bangkok traffic). The boat goes through Bangkok neighborhoods tourists don't normally visit and ends at Wat Sriboonrueng, an interesting temple that used to be on the outskirts of Bangkok but thanks to sprawl is very much in Bangkok. If you want to visit a shopping mall, you can hop off at the Bang Kapi Pier, where Bang Kapi Mall has a khlong side entrance. 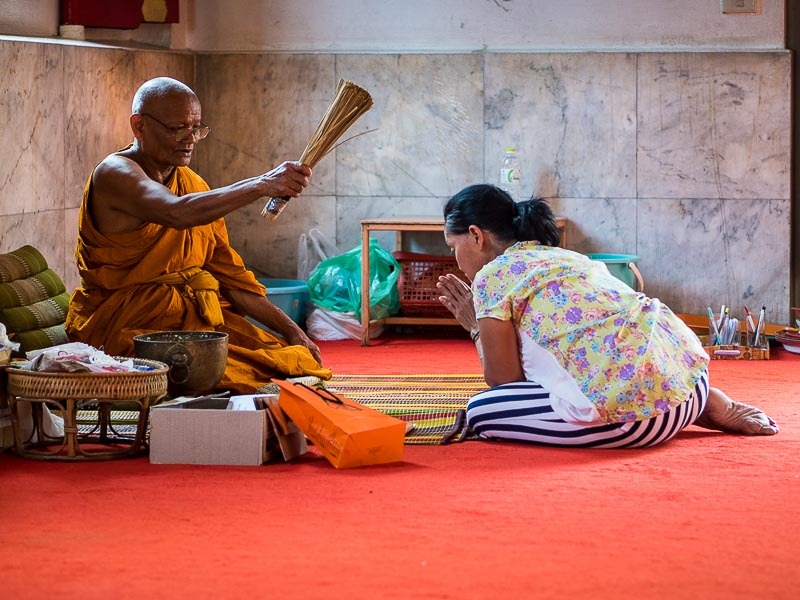 A monk blesses a woman at Wat Sriboonrueng. The worst part of riding the boat is the getting on and off. The stops at the piers are very brief and you have to be ready to, quite literally, hop on and off the boat at the right time, sometimes while it's still moving. There are no doors or easy access to the boats. They pull up to the pier, passengers getting off pile out and then seconds later, passengers getting on hop on and crawl over and through the ropes hanging from the roof of the boat and try to find a seat. A woman buys a ticket from the ticket seller who walks along a narrow (maybe six inch wide) platform that wraps around the boat. The blue curtain is raised to keep passengers dry. The truth is riding the boat is not my favorite way of getting around Bangkok. The boat line parallels the Sukhumvit Skytrain line, so if I'm going up or down Sukhumvit I ride the train. But if I'm going out to the Ramkhamhaeng suburbs, the boats are much faster and cheaper than taxis. 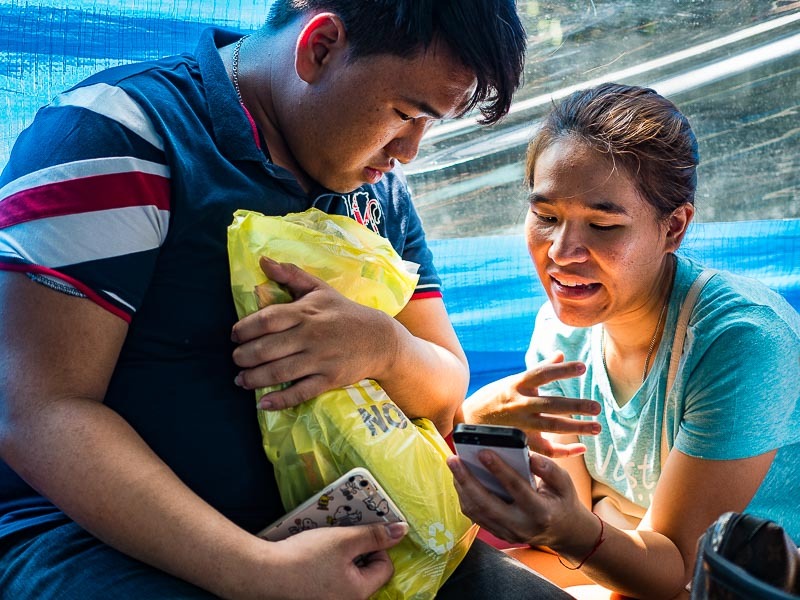 A couple on the boat study her smart phone. There are a lot more photos of life along Khlong Saen Saeb in my archive.